Who’s ready for an easy vegan holiday dessert? I know I am! I’ve had this one in my holiday recipe holster since first creating it this past summer, and have been dying for the right time to share it. A quick note about this recipe: The pictures make it look HUGE, but it’s actually a small dessert with fairly dainty portions. I use a small 4×8-inch loaf pan. If you use a standard-size (9×5-inch) loaf pan, the dessert will have less height (but no less delicious flavour!). Hey—I’ve never complained about dessert in any shape or form, but I wanted to mention it so you don’t find yourself puzzled over a smaller-than-expected finished product. 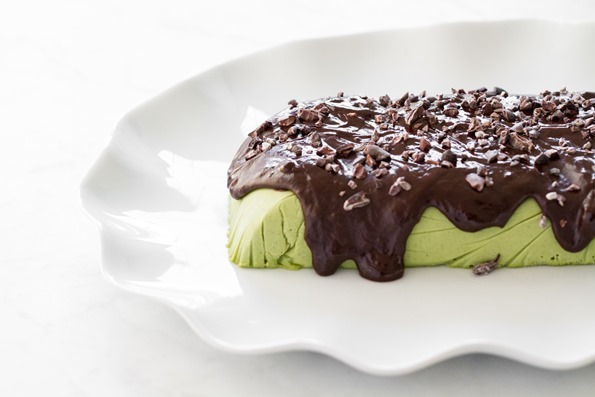 This peppermint patty is a showstopping dessert that's coloured naturally with spinach—though only you and I will know its nutritious secret! As an added bonus it’ll only set you back 15 minutes of prep. The filling calls for at least 4 hours of freezing time, so I like to whip it up before bed to pop in the freezer overnight. This way, all I have to do the next day is add the ganache on top and freeze it for another 10 minutes. If you’re making this dessert around the holidays, it’s delightful served with a crushed candy cane topping. My standby, year-round topping is raw cacao nibs, which also add a lovely (and nutritious!) crunch. The crunchy topping really completes the dessert, so I don’t recommend skimping on it, and be sure to serve additional cacao nibs or crushed candy cane on top of each slice before serving. Lastly, it’s important to use a very small loaf pan so the dessert has height. I use a 4x8-inch loaf pan by Baker’s Secret. You could also try making individual servings by filling a silicone cupcake mold. 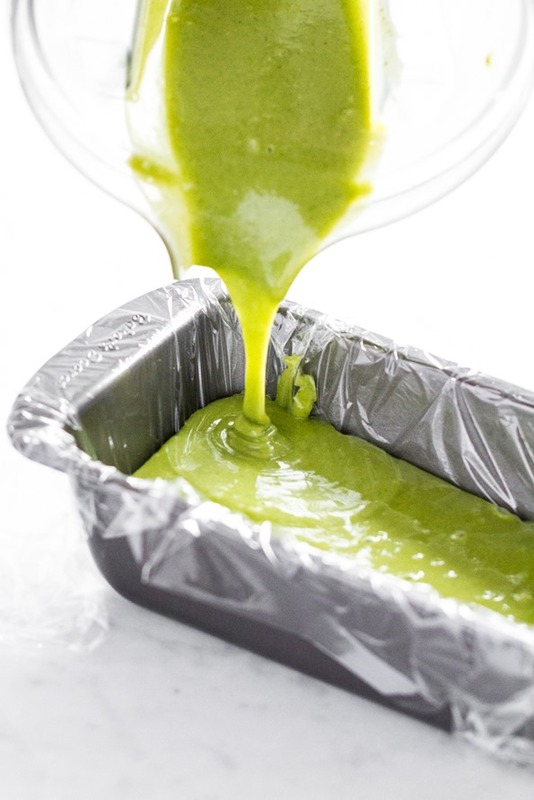 Line a small (approximately 4x8-inch) loaf pan or 6-inch cake pan with plastic wrap so the slab will be easy to lift out after freezing. Add all of the filling ingredients (cashew butter, maple syrup, melted oil, almond milk, 1 teaspoon peppermint extract, spinach, and salt) into a high-speed blender. Blend on high until smooth. Make sure no chunks of spinach leaves remain. Taste and add more peppermint extract if desired. Pour the filling into the prepared pan. Place the pan on a flat spot in the freezer and freeze for 4 to 5 hours, until the filling is solid. There’s no need to cover it unless you plan on keeping it in the freezer longer than 8 hours. 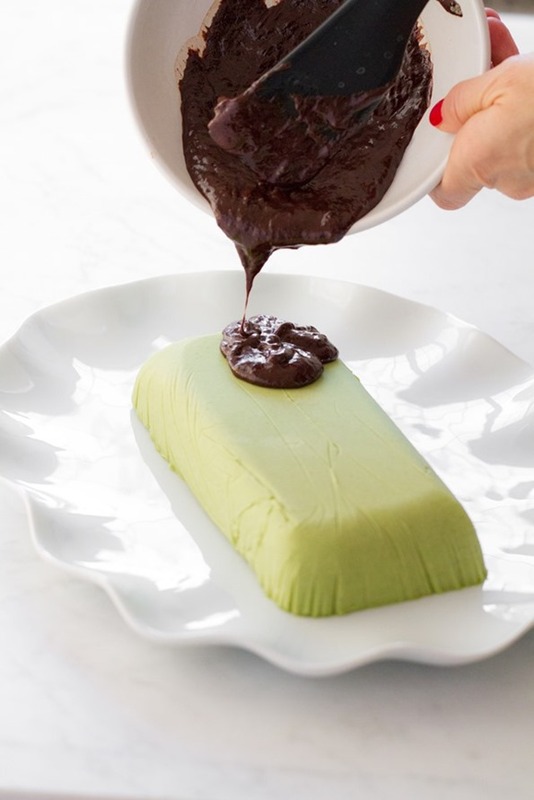 When the filling is solid, prepare the ganache topping. In a medium pot, combine the chocolate chips, coconut cream (make sure water is drained before adding), and salt. Melt the chips over the lowest heat setting, stirring frequently, until smooth. Remove the filling from the freezer and, gripping the plastic wrap as a handle, lift it out of the pan. Flip the filling onto a large plate and peel off the plastic wrap. Pour the ganache over top of the solid filling, starting in the centre, and allow it to cascade down the sides a bit. Immediately scatter the crushed candy cane or cacao nibs all over the ganache. Return it to the freezer, uncovered, and freeze for about 10 minutes, until the ganache is firm. Slice and garnish with fresh mint, if you’re fancy! Sprinkle additional cacao nibs or crushed candy cane on top of each slice and enjoy immediately. Return leftovers to the freezer right away as the dessert does soften as it sits. Nutritional info includes chocolate topping. * Instead of cashew butter, you can use 1 1/4 cups (180 g) of soaked raw cashews. Soak them in boiled water for 1 hour, rinse, drain, and add them into a high-speed blender (such as a Vitamix) along with the rest of the ingredients. If your blender has a hard time blending nuts smooth, I suggest that you use the raw cashew butter version instead. You can also use homemade raw cashew butter. To make your own, simply process raw cashews in a heavy-duty food processor until smooth. I don’t recommend using roasted cashew butter as it gives the slice a strong nutty flavour. ** The intensity of peppermint extracts vary by brand, so 1 1/2 teaspoons is intended as a guide—please add it slowly to taste. *** I only recommend using spinach if your blender is good at blending leafy greens smooth. If your blender tends to leave spinach chunks in smoothies, I would suggest omitting the spinach in this recipe just to make sure you aren’t going to find spinach chunks in the slice. Or see my tip about using a food processor below. **** Coconut cream is the solid white cream in a can of full-fat coconut milk. Chill the can overnight before using to ensure the coconut cream is solid. I like to open a mini can (160 mL) of full-fat coconut milk for this recipe; this way, there isn’t a lot left over to use up. The remaining amount is just perfect for throwing into your next smoothie! No blender? No problem! If you have a heavy-duty food processor you can make the filling in the processor, just be warned that the spinach doesn’t break down fully (my version had some very fine green speckling resembling mint sugar), and you’ll want to run the processor for a good while to help the spinach break down as much as possible. If you don’t have cacao nibs or crushed candy cane on hand, feel free to top the ganache with finely chopped dark chocolate. My own love for mint and chocolate must be genetic then. I remember always going crazy for those chocolate-covered mint sticks around the holidays. You might want to throw some fresh mint right into the filling too. I meant to try that myself, but ran out of fresh mint. Yay for the ideal holiday table dessert! My daycare moms, children, teens and I all fell for this decadent dessert. It was so quick to make…simple and straightforward, that the luxurious result took me by surprise! I know they are going to be happy when they see this post…none of them could wait for the recipe to come out! Thanks Nicole! To think we were sitting on this recipe for months and months..how evil…hahah. Thanks for all your help with testing. Oh I love this idea, Becky! Pistachios are so good…I don’t buy them enough. This look at amazing!! Is there anything that can be aubstituted for the cashew butter? Would soaked almonds work? Or pine nuts? Allergies…*sigh* Thank you!!! Hey Aimee! I haven’t tried it yet, but if I was going to try a nut-free version I would probably use 3/4 cup soaked raw sunflower seeds. Do you think i could swap out the peppermint extract for fresh mint leaves and then put a bit less spinach? Fresh mint works wonderfully in this recipe. We have a patch of Chocolate Mint growing in our garden. 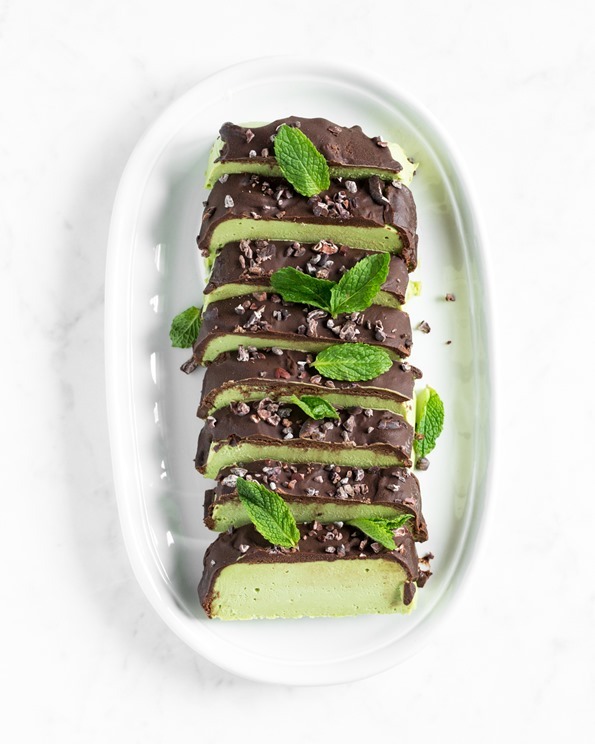 To meet the demands for this dessert from my kids, I have made it many times, often swapping out the mint extract (or even leaving it in!) and using 1/3 cup packed mint leaves. No need to reduce the amount of spinach. It turned out lovely! 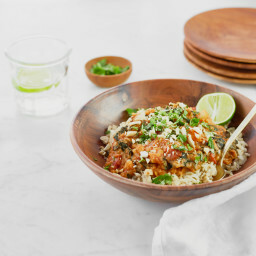 In fact, this recipe turns out incredibly well every time, whether I use soaked cashews, cashew butter, mint leaves, mint extract…it’s a keeper! If you are using a stronger flavoured mint, such as spearmint, you’d want to start with 1/4 packed cup and add more to taste. With fresh mint, the flavour intensifies as the patty chills. Delicious! How long will this keep out of the frig ? Hi there, Not long at all…it starts to soften quickly. I’d say no longer than 10-15 minutes to be sure! Do you have an alternative to cashews? For those millions suffering from IBS, cashews are the only dominant nut that is high in FOD-MAPS (specifically oligos [GOS & Fructans]). Hey Beth, I haven’t tried it but I would probably try 3/4 cup soaked raw sunflower seeds! If you try it out please let me know how it goes. Ohh I can’t WAIT to try this one! 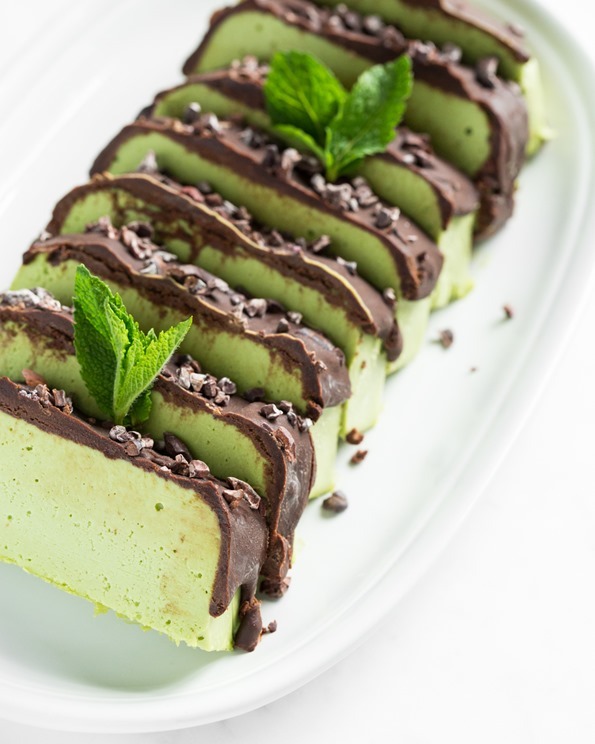 It seems like I always focus on chocolate and gingerbread things, but never make enough mint desserts! This looks so good! I’m not that good at the kitchen, but I’m gonna have to try this myself. Thanks for sharing the recipe! Do you have a suggestion on what to use instead of coconut oil? We don’t use any oil in our house, but this looks delicious! Would it turn out ok without it? Hey Danielle, The coconut oil is used to help the freezer dessert solidify, without it I’m afraid it would be too soft. What about trying cocoa butter? It’s stronger in flavour though so I’m not sure about the taste. Tried this tonight and they were amazing!! I am a huge mint chocolate fan and it completely satisfied my craving. 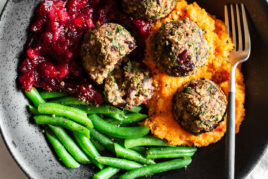 It’s so nice to have healthy recipes to share for the holidays and that everyone can enjoy. Thank you! Hey Angela, Glad to hear you’re a big chocolate-mint fan like me! So happy it was a hit. Hey Lisa, I’m so happy you made it and loved it! Thanks for letting me know. Love the colors here! This reminds me of a semifreddo; love the idea of the crunchy nibs on top! Thanks Annalise! Yes, the nibs on top are key! Need that crunch. 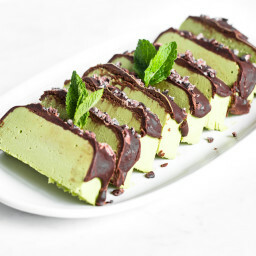 Has anyone used this recipe for other ice cream desserts? Thanks! These are amazing, make them now!! I made this recipe for a holiday party this weekend and they were a huge hit. Everyone loved that they were green because of spinach, and I was told they’re essentially salad, so they’re healthy, right?! I only had roasted cashew butter, not raw, so mine turned out darker green than the photos, but still beautiful. This recipe made 2 dozen mini cups which I did in a silicone muffin pan. They popped out easily once they were completely frozen. My husband took a few skiing with him as well, and while they melted from not being in the freezer all day, they were the perfect high energy snack. I plan to make more of these since I still have candy canes left over. So good and super easy!! Hey Leslie, Oh I’m so glad it was a hit and I LOVE reading all your tips/modifications. That’s great it worked with roasted cashew butter, too. Thanks for your review! It looks so good! I’d like to try this – I have all the ingredients at home. Do you think I could use an oiled non-stick-christmas-tree-shaped pan? THIS. So so so impressed with the creativity and the ingredients – must try soon! 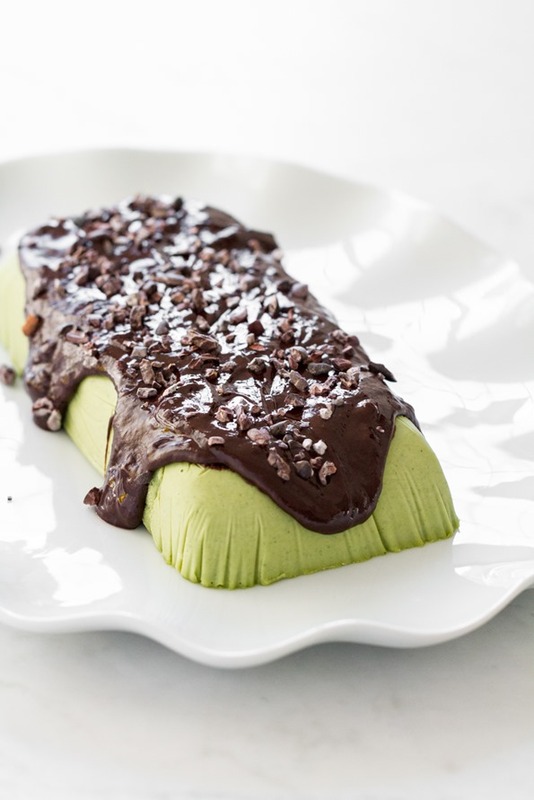 My favorite plant – based dessert recipe so far! I made in cupcake tins and garnished with crushed peppermint candies. I need to make another batch for Christmas now because my husband and I have eaten the entire first batch. Yum!! Hi! Can I use coconut cream in a can instead of coconut milk??? Also if so should I chill it over night as well? Hey Whitney, Do you mean instead of the 6 tbsp almond milk? If so, I can’t see why not. I think you’d need to chill it for roughly the same time. Finally, a way to trick my kids into eating spinach! Muahah. Seriously though, it looks delicious! haha for real!! ;) I hope you all enjoy it! Hello Angela, just made the greenixture tastes so good! I m just wondering how i’m supposed to cover it in the freezer, as I m going to make and pour the chocolate mix on it tomorrow, so it will be more than 8 hours in the freezer…I put a Saran wrap without it touching the mixture..and why is it important to cover it if it’s more than 5. Hours in the freezer? Thanks! Hey Julie, So glad you’re trying this dessert! Frozen desserts like this one tend to get some frost on the top if they’re in the freezer for extended periods of time, and I find covering them helps prevent this a bit. (Either way it’s not a big issue as it’ll be covered with chocolate anyhow!). I hope you enjoy the slice! Looks amazing! I love chocolate and mint. Do you think there is a way I can make this sugar-free? Using Stevia or something? Hey Margy, I’m sorry but I’m not sure. I don’t bake with stevia (it gives me headaches) or other sugar-free sweeteners. Sorry I can’t help! I made this for Christmas. It was delicious! Thank you so much for posting this. Hey Lori, So happy that you tried it out for Christmas. Thanks for letting me know how it went! Merry Christmas! Hey Cassandra, I’ve swapped the cashew butter for 3/4 cup soaked raw sunflower seeds and it worked. The flavour changes a but but still a nice option! Hope this helps. I am allergic to cashew. Any other nuts I could replace cashew with? This looks yummy and I want to try it. Wow, I made this for a fitness bootcamp to start off the New Year and it came out incredible! So dense and similar to a fudge consistency. Smells amazing and I actually used almond butter and it was a hit. Hey Erika, Oh I like the way you think…I need to go to your fitness bootcamp! lol. So glad it was a big hit. I agree with you on the fudge consistency. I’ll have to try it with almond butter. So far I’ve tried cashew and soaked raw sunflower seeds (I used about 3/4-1 cup with success). All I can say is WOW! This recipe is absolutely amazing. I made this recently for a holiday party and it was a HUGE hit (amongst many people who had no idea it was vegan) =) Thank you! Hey Alanna, Yay, that’s great news! Thank you so much for letting me know. :) Happy New Year! I posted this on my Pinterest site. I love it and have made it 3 times over the Christmas holidays. We chunked it up and served small blocks as the recipe doesn’t make that much. I used cashew butter the first time then the soaked cashews the other two and I didn’t see much difference. The last time I made it without the chocolate coating and I think I like it better that way. It is very rich and delicious. We played with the amount of peppermint extract and 1 or 1.5 tsp. worked well. 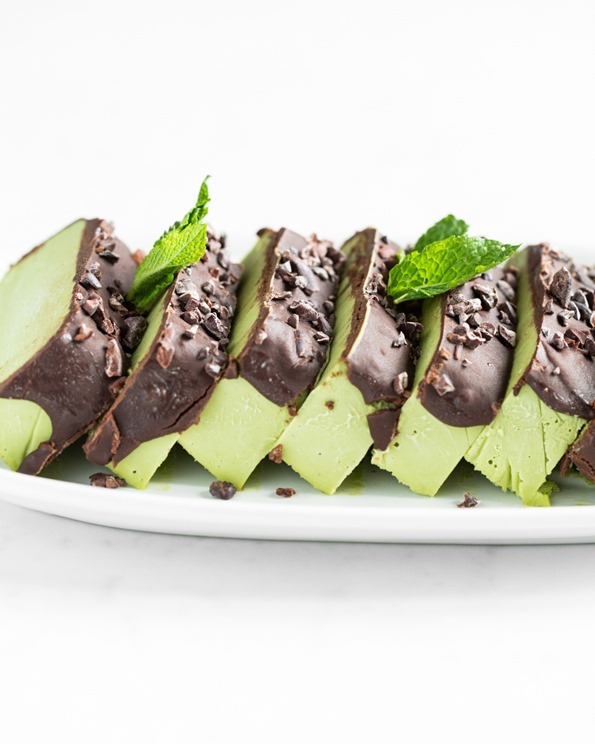 Funny thing… the omnivores had a hard time believing there was spinach in this dessert. It is so little and the other flavors are strong that it just colors it. Hey Annabelle, Oh I love your feedback so much. Thank you! No one ever believes me that there is spinach in it too. It’s such a fun conversation starter. ;) Thanks for the pin too! I made this today (using soaked cashews instead of cashew butter). It is fantastic! It is already my husband’s favorite dessert. I have yet to try a bad recipe from this site. Thank you! Hey Sasha, Oh wow, that’s so exciting…thank you! I’m so happy you’ve loved the recipes so much. :) Thanks for the feedback! This was SO delicious! I am already dreaming of pouring the filling into popsicle molds and coating with homemade magic shell to make “dilly bars” OSG style! OMG what a great idea!! How good would that be? 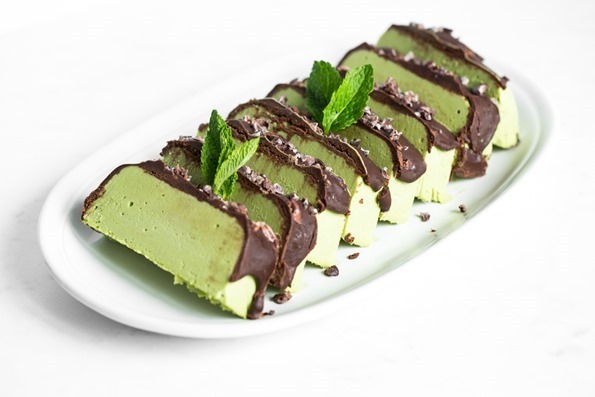 I have just made this peppermint dessert and as usual it was amazing. I put them in cupcake wrappers , removed the papers when frozen and then put the ganache over top and sprinkled with crushed chocolate. I made them into individual desserts for ease of serving. It reminded me of your pumpkin dessert with the sunflower butter. I have never been disappointed with any of your recipes, they are always crowd pleasers. 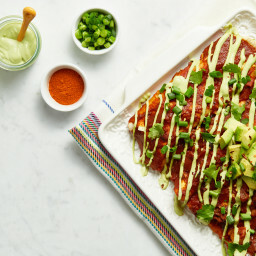 Everyone in my family, except my husband the last hold out, is a vegan so your recipes are always a welcome part of all of our family gatherings. Thank you so much! Hey Debbe, I can’t thank you enough for your support and kind words! I’m so flattered that you and the family make so many of my recipes. :) I love that you make this slice into mini servings too…it’s so easy that way! Made this tonight and it was phenomenal. The texture was creamy like nothing else (creamier than ice cream, gelato, brie, etc). I didn’t want to spend $5 on peppermint extract so I used my peppermint essential oil (20 drops), the flavor was perfect. The ganache was not glossy or pourable though, I wonder if it would work better melted in a double boiler instead of right in the pan? Thanks for an excellent recipe! Hey Christy, So glad you loved it! I go nuts for anything chocolate and peppermint…so refreshing, isn’t it? About the ganache, mine was pretty thick and I wouldn’t call it pourable..I had to scoop it out of the dish (check out that photo action shot if you’d like). Also, it’s important when you add the coconut cream not to add any coconut water along with it as water can “seize” the mixture. Hope this helps! Thanks for this easy/ quick to assemble recipe!! I have made this several times. The first, exactly as the recipe is written. The second and third without the chocolate topping. It is delicious unadorned and a bit too sweet for me with the chocolate. The non vegan, non health foodies as well as the vegans in the gatherings were very impressed and surprised that this contained spinach. My next experiment is to see if I can get the mint flavor without the extract using fresh mint. I’ll wait until summer when mint is prolific for this. Hey Annabelle, Thank you so much for your feedback! I’m so happy it was a hit. We’re all peppermint fanatics in this house. ;) I will be trying it with fresh mint in the summer too. Mmmmmm can’t wait. I absolutely love this recipe! 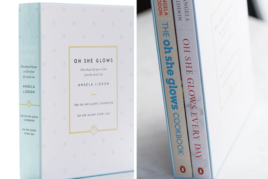 I made it for cookbook club a few weeks ago and it was everyone’s favorite of 20 dishes! I do have a question, though: how long does it last in the freezer? Thank you! Aww that makes me so happy! Thank you :) It should last in the freezer for 1-2 months. Making sure it’s frozen solid first, I then wrap it with plastic wrap or tinfoil tightly and place it inside a freezer bag or an airtight container. Thank you! Even my kids, who will not eat anything that a green vegetable has touched, couldn’t get enough of it. Delicious! Question: why do I need to soak the cashews in boiled water? Could not normal soaking for 6 hours be fine? I’m just concerned losing the nutrients by pouring boiled water over the nuts. Quite the drool-worthy recipe! Just the smell of it is enough to get the saliva glands hopping. But I have been having trouble with getting it to freeze solid even overnight. It’s not the freezer; everything else freezes fine. I have been using commercially available cashew butter (I assume you mean the kind that’s like peanut butter) BUT I have had to substitute soy milk for almond milk due to an almond allergy. I freeze it in a sealed plastic container. It still tastes great but is a tad too gooey in the center! Is it the milk that is the problem, do you think? Hey Floyd, Thanks for trying this out! It could be the soy milk (it’s higher in protein than almond so not sure if that would impact it) or the cashew butter. I would check the cashew butter label to make sure that it only says “cashews” on the label and doesn’t have any other ingredients added to it. Hello! I was wondering about a cashew free alternative? and it was really good. However, made the mistake of roasting the cashews because another site said that it releases the oils and gives a better blend….but the colour is too dark I think. Hey Kim, thanks for sharing your experience with the peppermint patty slice :) So glad you enjoyed it even with the roasted cashews. This look insanely good! I love, love, love the spinach in there. I know you probably used it for color, but it’s nice to sneak in those greens when no one’s watching. Especially for my kids who “don’t like vegetables”. Thank you for another fabulous recipe. I can’t wait to try it! I love that idea Peter :) I’d love to hear how it goes! This has become a new family favorite, so delicious! 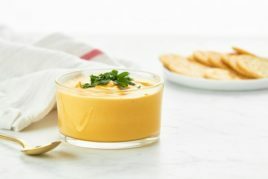 I’ve had this recipe on my list ever since you originally posted it and I made it for the holidays this year, except I forgot about it in the freezer until now! But ohmygosh am I glad I did, just means I don’t have to share it with anyone lol! It’s so delicious, and the ganache is so tasty and quick and easy to make, I was literally licking it out of the pot. 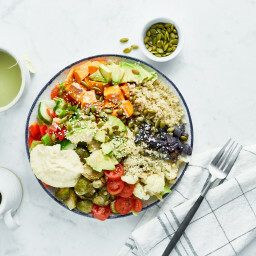 Thank you so much for this really creative recipe, I love that you manage to sneak in healthy ingredients like spinach for the nutritional boost and the colouring, really clever. I wonder if there could be a version with orange? Chocolate and orange are my ultimate fav combo! haha that’s hilarious…I don’t think I have ever forgotten about a dessert in the freezer! What a happy surprise. I’m so glad you love this one so much. And yes a chocolate-orange version would be so good! 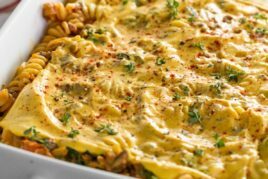 I was attracted to the recipe because it said easy and I had so much to prepare for our holiday meal. Boy! this is the best discovery of 2018 for me. Everybody, vegan and not, loved it and asked for the recipe. Thank you so much for this easy, delicious, nutritious raw desert! 5 stars in my book!